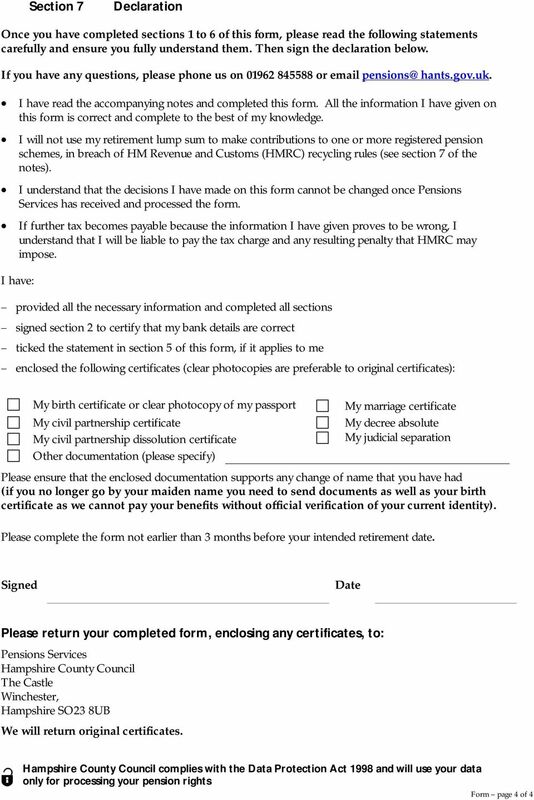 Download "Local Government Pension Scheme Hampshire Pension Fund Retirement declaration form Explanatory notes"
2 Local Government Pension Scheme Hampshire Pension Fund Section 1 Personal details Please complete all parts of this section and enclose your birth certificate (clear photocopies are acceptable) or a copy of the relevant pages of your passport. Section 2 Bank and building society account details Please give us full details of the bank or building society where you want your pension and any retirement lump sum paid. We will pay your pension and any lump sum by BACs. Unfortunately we cannot pay your pension or lump sum into a Post Office account because they cannot accept these types of payments. Section 3 Marital status and civil partnership Please tick the appropriate box and enter the date of marriage, civil ceremony or divorce, if relevant. Please enclose a copy of your marriage certificate, civil partnership certificate, decree absolute, final order or judicial separation. Please let us know if you have nominated your co-habiting partner so we can ensure that our records agree. You will have sent us a Nomination of co-habiting partner form with appropriate evidence. 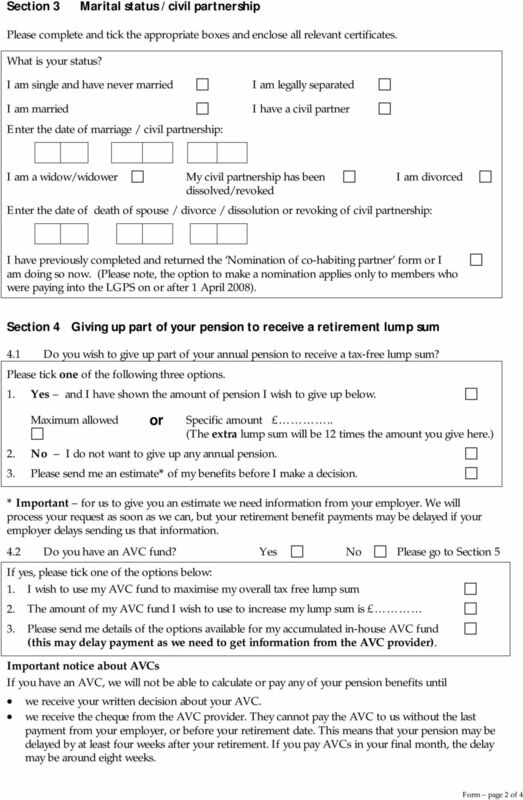 You can nominate a co-habiting partner by downloading the form from You may nominate your partner only if you were paying into the LGPS on or after 1 April Section 4 Giving up annual pension to receive a tax-free retirement lump sum Section 4.1 You may choose to give up part of your annual pension to receive a tax-free lump sum. Doing so will not affect the value of pensions payable to your dependants after your death. 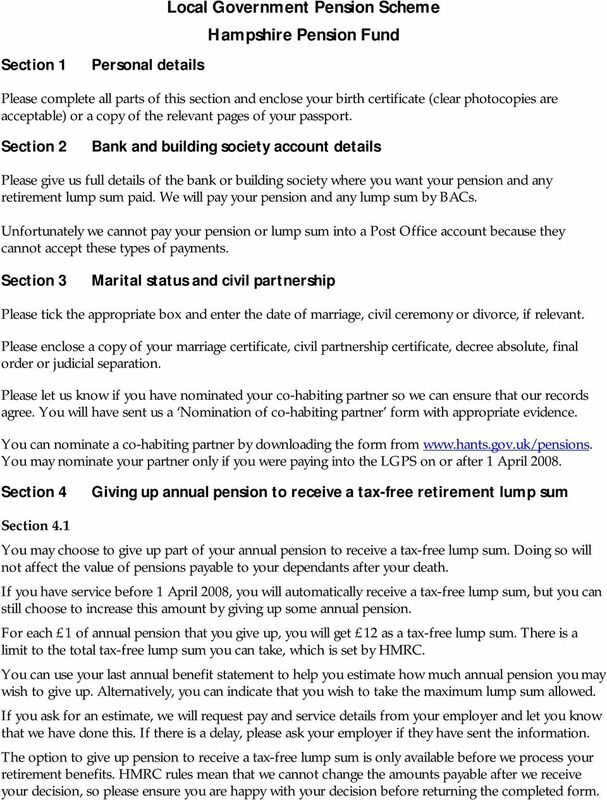 If you have service before 1 April 2008, you will automatically receive a tax-free lump sum, but you can still choose to increase this amount by giving up some annual pension. For each 1 of annual pension that you give up, you will get 12 as a tax-free lump sum. There is a limit to the total tax-free lump sum you can take, which is set by HMRC. You can use your last annual benefit statement to help you estimate how much annual pension you may wish to give up. Alternatively, you can indicate that you wish to take the maximum lump sum allowed. If you ask for an estimate, we will request pay and service details from your employer and let you know that we have done this. If there is a delay, please ask your employer if they have sent the information. The option to give up pension to receive a tax-free lump sum is only available before we process your retirement benefits. HMRC rules mean that we cannot change the amounts payable after we receive your decision, so please ensure you are happy with your decision before returning the completed form. 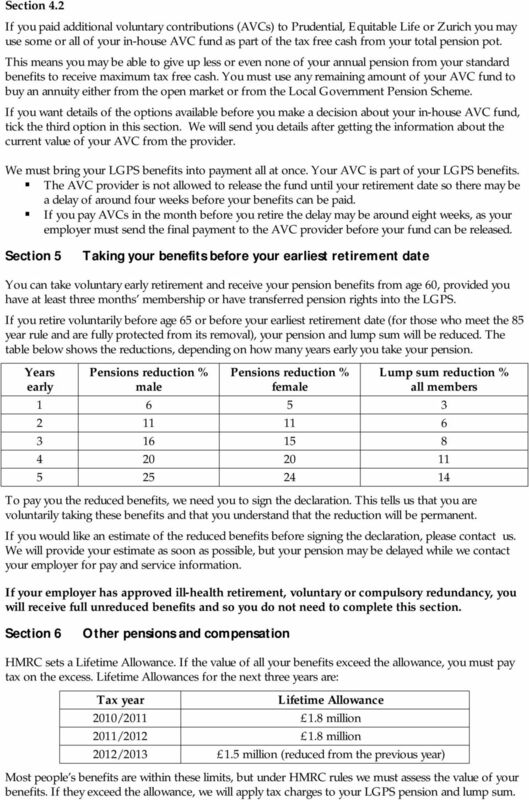 3 Section 4.2 If you paid additional voluntary contributions (AVCs) to Prudential, Equitable Life or Zurich you may use some or all of your in-house AVC fund as part of the tax free cash from your total pension pot. This means you may be able to give up less or even none of your annual pension from your standard benefits to receive maximum tax free cash. You must use any remaining amount of your AVC fund to buy an annuity either from the open market or from the Local Government Pension Scheme. If you want details of the options available before you make a decision about your in-house AVC fund, tick the third option in this section. We will send you details after getting the information about the current value of your AVC from the provider. We must bring your LGPS benefits into payment all at once. Your AVC is part of your LGPS benefits. The AVC provider is not allowed to release the fund until your retirement date so there may be a delay of around four weeks before your benefits can be paid. If you pay AVCs in the month before you retire the delay may be around eight weeks, as your employer must send the final payment to the AVC provider before your fund can be released. Section 5 Taking your benefits before your earliest retirement date You can take voluntary early retirement and receive your pension benefits from age 60, provided you have at least three months membership or have transferred pension rights into the LGPS. If you retire voluntarily before age 65 or before your earliest retirement date (for those who meet the 85 year rule and are fully protected from its removal), your pension and lump sum will be reduced. The table below shows the reductions, depending on how many years early you take your pension. Years early Pensions reduction % male Pensions reduction % female Lump sum reduction % all members To pay you the reduced benefits, we need you to sign the declaration. This tells us that you are voluntarily taking these benefits and that you understand that the reduction will be permanent. If you would like an estimate of the reduced benefits before signing the declaration, please contact us. We will provide your estimate as soon as possible, but your pension may be delayed while we contact your employer for pay and service information. If your employer has approved ill-health retirement, voluntary or compulsory redundancy, you will receive full unreduced benefits and so you do not need to complete this section. 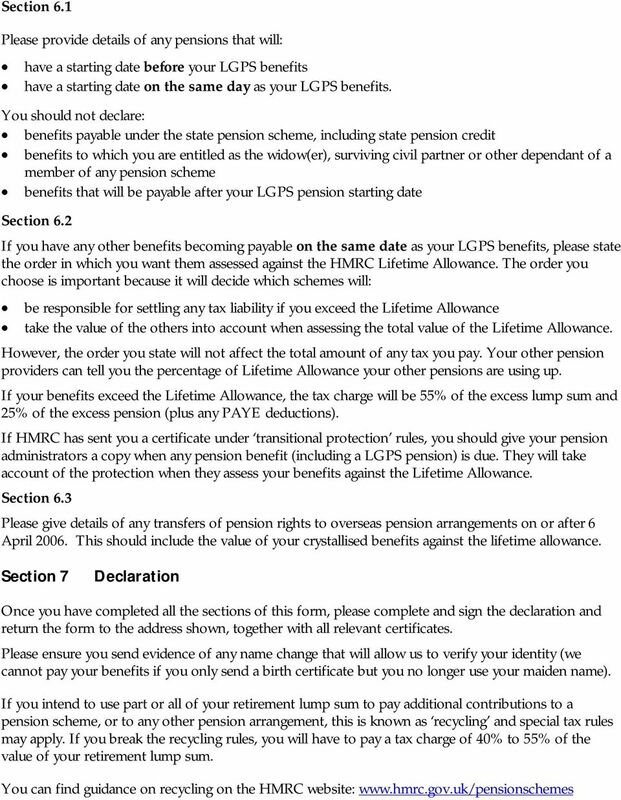 Section 6 Other pensions and compensation HMRC sets a Lifetime Allowance. If the value of all your benefits exceed the allowance, you must pay tax on the excess. Lifetime Allowances for the next three years are: Tax year Lifetime Allowance 2010/ million 2011/ million 2012/ million (reduced from the previous year) Most people s benefits are within these limits, but under HMRC rules we must assess the value of your benefits. If they exceed the allowance, we will apply tax charges to your LGPS pension and lump sum. Rhondda Cynon Taf Pension Fund A Guide To Your Retirement Contents page Introduction / Contact Us 3 When Can I Retire? 4-5 Calculating your Benefits 5-7 Ill Health / Redundancy 7 What do you need to consider? AXA Wealth. Uncrystallised funds pension lump sum benefit options. 1 of 5. When to use this form. Have you received advice or guidance? APPLICATION BY TEACHER FOR RETIREMENT PENSION AND LUMP SUM To be completed when applying for payment of Preserved pension and lump sum at age 60/65. Please use BLOCK CAPITALS only and blue or black ink, ticking boxes where appropriate. 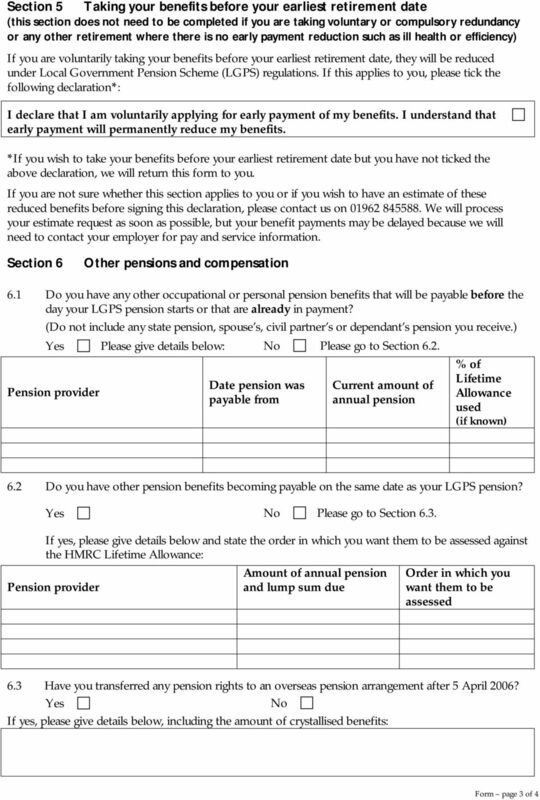 Police Pensions Scheme FAQ s. Q. What is the level of my contribution each month? 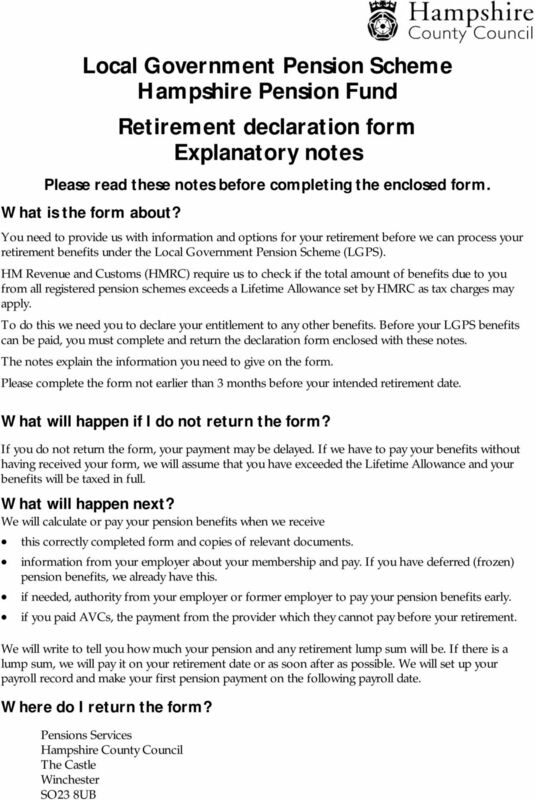 HSC Pension Scheme Information about Transfers Overseas Introduction This leaflet contains information about important changes to the HM Revenue & Customs (HMRC) tax rules with effect from 6 April 2006. Secure benefits the scheme provides you with a future income, independent of share prices and stock market fluctuations. Triodos Bank. Ethical Stocks and Shares ISA application form. Triodos Bank. Ethical Stocks and Shares ISA application form. This is an application for a Triodos Ethical Stocks and Shares ISA for the tax year 2015/2016 and each subsequent year until further notice. Additional Pension April 2011 Additional pension is a pension you can receive as well as your standard benefits from the Teachers Pension Scheme (TPS). Teachers Pensions cannot provide financial advice. TERMS AND CONDITIONS PENSION ANNUITY. 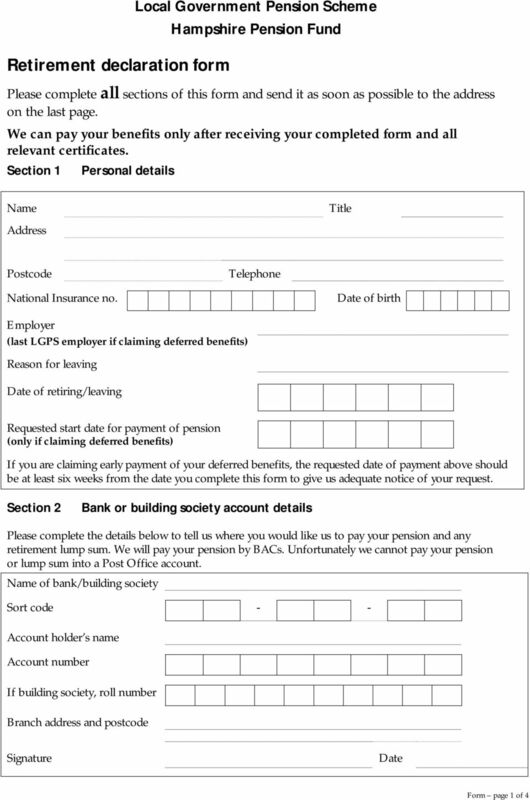 The Firefighters Pension Scheme 2015 Notice to opt out of pension saving The Firefighters Pension Scheme 2015 (FPS 2015) allows you to save while you are working in order to enjoy a pension once you retire. classic retirement benefits A brief guide to the benefits available Who should read this booklet? This booklet provides a guide to pension benefits for anyone leaving and taking their classic pension.